Welcome to MDS Optics. We are the premier internet retailer of fine optical products like rifle scopes for hunting and shooting. Our sports optics product line includes fine brands such as Aimpoint, Burris, Bushnell, Eotech, Leupold, Redfield, Sightron, Simmons, Tasco and Weaver. We are your riflescope superstore. We also have a complete lineup of riflescope accessories, such as scope mounts, scope bases, scope rings and riflescope care and maintenance products. Our other optic products include sport and hunting binoculars, rangefinders, spotting scopes and red dot sights for sale. But hunting and shooting optics are not the only things we sell. We sell everything tactical. Including AR-15 parts and accessories. And items for other military style rifles like AK47 parts. As well as products for self defense and accessories for tactical shooting and firearms. Products like laser sights and tactical and weapon lights. We also stock a full line of reloading supplies and equipment. We have all the shooting and tactical gear you would want and more. And we feature the lowest prices and shipping costs around. From rifle scopes to tactical gear, we offer over 45,000 products from more than 280 manufacturers. 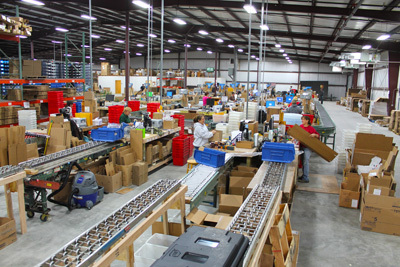 We have multiple warehouses containing hundreds of thousands of products in stock and ready to ship to our customers. Automation assures your product will be on its way in three business days or less. Our product packaging is next to none and insures that your product will arrive in the best condition. We have products that the big box stores don't have. Such as tactical and shooting accessory products. Our main emphasis is on customer satisfaction and experience. We work hard to assure this. So you can shop our store be confident that we are giving you the best possible deals on products of the highest quality. And if you are not satisfied, we will make it right. We feature an easy return process with no restocking fees and a complete refund, including shipping costs. We appreciate any feedback from you the customer as to how we can serve you better. We stand ready to make you the customer satisfied under any condition.